Spawning in Midcoast Maine starts late May and continues much of the summer. The smaller males attach by claspers and fertilize eggs just after deposition, before the female buries them in the sand. The newly hatched larvae resemble trilobites, to which horseshoe crabs are distantly related. 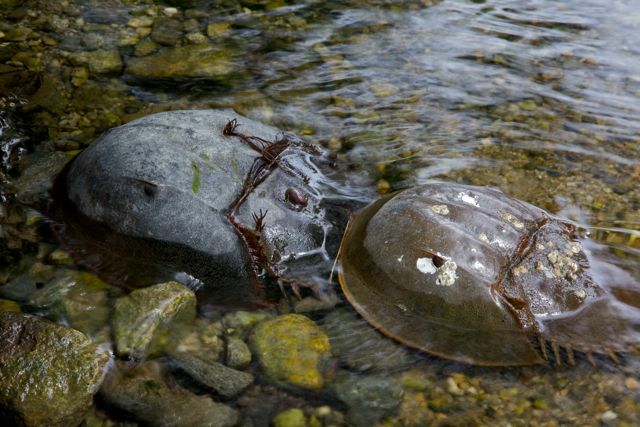 Limulus polyphemus: said aloud, the Latin name of the horseshoe crab is a true example of euphony, literally “sweet-voiced,” or pleasing to the ear. One supposes that the species name refers to the eponymous one-eyed Cyclops of Homer’s odyssey, since horseshoe crabs do have a centrally located simple eye, albeit complemented by two bilateral compound eyes. The animal itself is also pleasing to the eye as it glides gracefully over the bottom, a sight familiar only to those living on the east coast of the U.S. — from about Bar Harbor, Maine, to the Gulf of Mexico — and the distant east coasts of Japan and southeast Asia (with the genera Carcinoscorpius, “crab-scorpion,” and Tachypleus, “swift sailor”). It is an ancient invertebrate of the chelicerata, a subphylum of arthropods that includes a group that is familiar to all, the spiders (arachnida). To stand on a sandy beach in June at a full or new moon, when tidal ranges are greatest, and watch the spawning mass come ashore — first the smaller males followed by the larger females — is to witness one of the oldest mating rituals on earth, given that the species in its present form is some 200 million years old, with antecedents dating to 400 million years ago. Out of the many tens of thousands of eggs laid in the sand at the high water mark and fertilized by one or more attendant males, it is thought that perhaps only tens of individuals will attain adulthood, some nine years later. Great numbers of the eggs are consumed before hatching by shorebirds, especially the red knot that times its northward migration from South America to the Canadian arctic to coincide with horseshoe crab spawning in Delaware Bay, the densest concentration of Limulus on the east coast. Fish and crustaceans also eat the eggs and newly hatched larvae that emerge about a month later during the next spring tide. They resemble tiny trilobites, that assuredly non-living group of fossil marine arthropods that at one time dominated life on earth, and with which the horseshoe crab may share ancestry. Morphologically, no zoological fiction writer could likely imagine as well the form that natural selection has wrought: the hydrodynamic carapace with its horned eyes followed by the spiny armored abdomen raking back to the dagger-like tail in the van. As a small child newly acquainted with the tidal shallows, there is nothing quite so eye-opening as to see Limulus scurrying across one’s toes. During the last several thousand years — a mere blip in its phylogenetic history — Limulus has provided tools and food for Native Americans who used the tail for spears and ate the meat; and more recently bait for eel and lobster fisherman and fertilizer for farmers; and presently blood for medical researchers. Many biologists fear that the species may be threatened from overharvesting, and various moratoria and management plans have been enacted in the past decade along the eastern and Gulf of Mexico seaboards to forestall local extirpation, or even extinction at the hands of humans, joining other mistreated species from our recent past such as the passenger pigeon and Labrador duck. With care and perhaps luck, Limulus will roam our waters for centuries to come.